Credit scores play a very important role in the financial world. They can directly affect you in many ways such as loan rates, your ability to get a loan, and insurance rates. This makes it especially important to understand what exactly is going into your credit score and what you can do to improve it. Here is a breakdown of what makes up a credit score to help you feel more confident and understand how certain decisions may impact your score. Installment and revolving credit payments are equally important. If you have a $10,000 total credit limit between all of your cards and carry a total balance of $2,000 that gives you a 20% utilization rate. Keep your balance and utilization rate as low as possible. 30% utilization is the “rule of thumb” number to stay under but the lower your utilization, the better. As you can see the first 2 factors make up two-thirds of your score. Pay your bills on time and carry lower balances. Keep your old accounts with good payment history open, even if you don’t use them. Maintain a good mix of installment and revolving accounts. Now that you understand what goes into your credit score, here are a few tips on how to improve it. Each of the 3 credit bureaus give you access to a free copy of your report annually. Dispute any errors and negotiate. Make sure to get agreements in writing before paying them. Check your credit limits on accounts to make sure they are correct. Become an “authorized user” on an existing account with good payment history. Keep credit limits high, but balances low. Under-use your cards. Don’t close out old accounts with good history. Try paying twice a month. This helps keep balances lower when they report your score monthly. 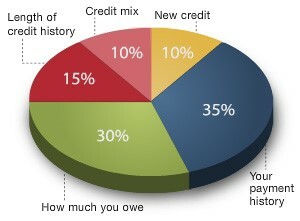 Who can report to the credit bureaus to impact your score? Banks, Card Services, and Charge accounts are the main reporters. Cell phone, cable, or utility bills can report missed payments or overdue amounts, but they do not report payments made on time. In other words, those type of payments cannot help your score, but they can hurt it. It is almost impossible for private financing to be reported because of the computer system and security requirements that are in place to report to the credit bureaus.